Because of the updates you have been sending me, I learned about the Disability ID now being given by the local government units (LGUs), plus information on the full implementation of RA 9442 or "Magna Carta for Disabled Persons” Click here for a complete copy. In Biñan, Laguna, where we reside, my son, Denver Patrick Pordesimo Clemente, 19, with autism, is now a proud card holder of PWD ID 014. It was so easy to apply for it. Last May 21, we went to the Social Welfare Unit in Biñan Municipal Hall, simply filled out the PWD ID application form. We were told to come back the following week. One week later, (May 28) Den and his elder brother, Jeffrey Allen, went back to claim the ID. They immediately went to Jollibee- Biñan Plaza Branch to celebrate. At first, the attending sales clerk was unaware of the 20% discount due to Den. After talking to the branch manager and verifying of the privilege, Den was given the discount, and enjoyed his Jollimeal. Den has also been making full use of for the past four years his PWD Transportation Discounted Fare ID Card No. 57188. Click here for more information. Our family has decided for Den to wear his PWD ID where ever and when ever we go out. Others might also do so if they wish. The ID is big and is easy to view and read. My son Den proudly wears that, too. Now….I will have to go back to the Municipio for my son’s medicine booklet. Click here to know more on the Medical Discounts for PWDs. Again, thank you for the service you have been giving us, ASP members. I have also told family, friends and even strangers about this good news! God bless you all and Mabuhay kayong lahat! 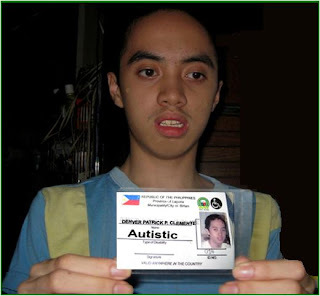 Click here to view the complete list of cities and municipalities issuing PWD cards around the Philippines applying for the PWD ID is the right of every person with autism.It erases the stigma that PWAs are second class citizens and it also gives more bearing to the existing law that protects them.